‘Drops before the rain? - India Sustainable and Responsible Investing Landscape 2017’ report, published by Oxfam India and cKinetics will be launched at a round-table at the National Stock Exchange in Mumbai tomorrow. The report endeavors to capture the current landscape of Sustainable and Responsible Investment (SRI) in India and investor perceptions on the sustainable and responsible investing in India. SRI considers performance of a company with respect to its natural capital (E), its interaction with the society, consumers, employees (S) and measures policies and processes of the company and management of stakeholder interests (G) to make better informed decisions. Investors are incorporating ‘ESG’ information in their financial decision-making process to have a holistic view of the companies they intend to invest in. 24 Asset Management Companies and 145 funds were analysed, as a part of the research, to arrive at the current SRI asset allocation by global and Indian investors for the Indian market. Additionally, over 35 stakeholders driving SRI in India were interviewed to map the current landscape and opportunities for Sustainable and Responsible Investment in the country. 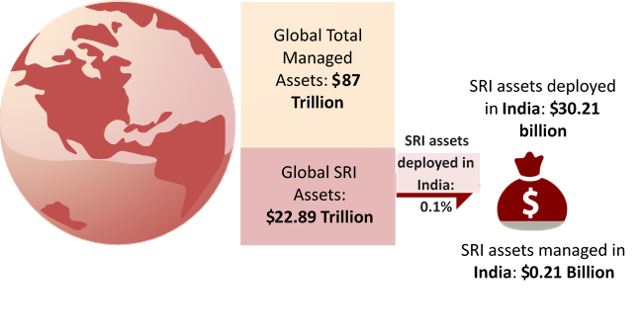 Globally, the assets deployed with SRI strategies stands at $22.89 trillion (₹1476 trillion), with ~$30 billion (₹1,962 billion) present capital being deployed with SRI strategies in India. 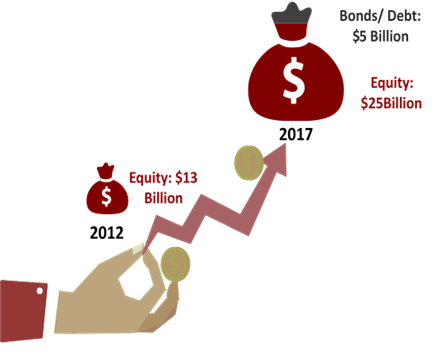 Though this is a small percentage as compared to the global asset, it is encouraging that there has been an almost 130% growth in Indian SRI assets, from $13 billion 5 years ago. It is also remarkable that as Indian asset managers begin to adopt ESG strategies, the benefits of acting on ESG factors is becoming high for companies. India’s enabling disclosure policy has created a framework for companies to engage in dialogue with their stakeholders, with sustainability reports considered as the most informative source of information to investors. It is also promising to note that 75% of the international investors were aware of the annual Business Responsibility Reports (BRR). The BRR is a standardized format that the Securities and Exchange Board of India (SEBI) has mandated for the top 500 listed companies in India. Oxfam India, which is leading the India Responsible Business Forum, works towards creating an equal, just and sustainable society by empowering the vulnerable and underprivileged. We work in partnership with NGOs at grassroot-level to address core causes of poverty and injustice. Oxfam India’s focuses its work in some of the poorest states of India, which include -- Assam, Bihar, Chhattisgarh, Jharkhand, Odisha and Uttar Pradesh. Our humanitarian teams have responded to 18 natural disasters and conflict in the last 5 years, such as floods in Jammu & Kashmir, Uttarakhand, Odisha and Assam, and we provide long-term rehabilitation interventions. cKinetics is a mission driven Sustainability Insight, Innovation & Capital Advisory Firm, working with businesses, investors industry groups as well as thought leaders to continually generate market insights and catalyze change.